Unlike Edwin, I am not a flexitarian. However, my husband Morgan and I try to limit ourselves to lean meats such as chicken or fish. We rarely eat a strictly vegetarian dinner and once every few months, we break down and cook with beef. 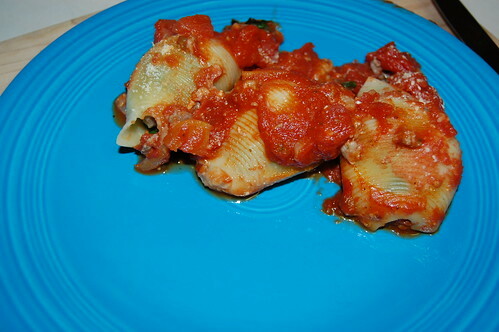 I was inspired by a recipe I found on blogchef.net – these stuffed shells are a little different than the kind you might typically find. Aside from the addition of beef, the blogchef recipe replaces ricotta cheese with mozzarella. 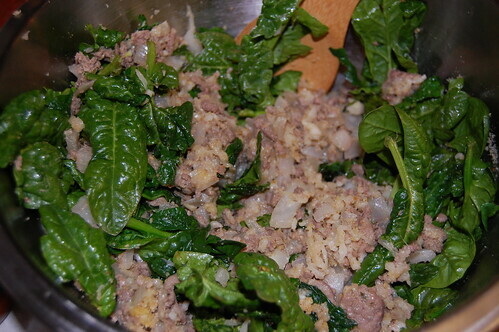 It also removes the usual spinach and adds dry red wine. But because I’m not a flexitarian, I need to get my vegetables wherever I can. I added half a bag of fresh spinach leaves, more garlic, and a can of Hunt’s diced tomatoes with green peppers, onions, and celery. I also left out the red wine and parsley. This recipe isn’t very difficult, but stuffing the shells gets a little time consuming. It’s very filling and makes an enjoyable and attractive winter meal for both the holidays as well as the weekly dinner rotation! Cook shells according to package directions. In a large skillet, brown ground beef, garlic and onion. Drain off excess grease (if you really want to cut down on even more fat, you can actually quickly rinse the ground beef, but you risk losing flavor). Preheat oven to 400 F.
In a large bowl, combine meat, shredded mozzarella, beaten egg, breadcrumbs, fresh spinach leaves, salt and pepper. In a 13×9 inch oven safe dish, add half the spaghetti sauce and half the canned diced tomatoes. 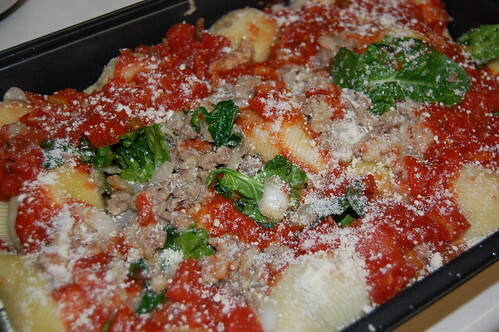 Stuff the cooked and drained shells with the meat/cheese/spinach mixture and place on top of the sauce in the oven safe dish. Pour the remaining spaghetti sauce and diced tomatoes over the stuffed shells. Sprinkle with parmesan as desired. Bake for 20-25 minutes and serve. She offers a ton of recipes on her site for download (for free). The book is really great too. I picked it up on amazon.com for around $16-17. Excellent! Thanks so much for the great recommendation. We’ll have to check that out. Mmmm… looks good. Though I have to admit, I don’t even remember the last time I cooked with beef. Will definitely check out the book! can i please come to ghost baker’s house for dinner? do you think this would work with ground turkey, or was the beef taste just too good? Kari – yes and yes! Please come to dinner, and I definitely think this would work with ground turkey. I’d probably go a little easier on the garlic if you plan to use that, though. Made this for my husband last night (with some variation) and it was delish! Tasted like it came from an Italian restaurant. Thanks for the recipe (will be making it with turkey another time for me). CMWG – Glad the husband enjoyed it! Let us know how the turkey works out for you. This was delicious. Used a green pepper instead of spinach for the vegetable addition and that worked well. Keep up the good work, gb.